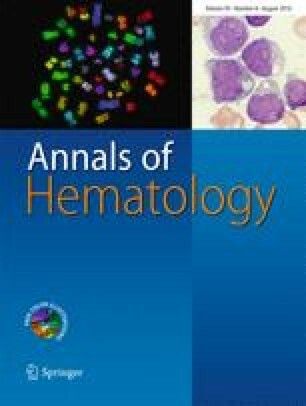 Hematopoietic neoplasms that develop after exposure to cytotoxic agents or therapeutic radiation primarily include myelodysplastic syndrome (MDS), myelodysplastic/myeloproliferative neoplasm (MDS/MPN), and acute myeloid leukemia (AML) . Although much less frequently encountered, therapy-related B-lymphoblastic leukemia has also been reported in the literature . Myeloproliferative neoplasm (MPN) arising as a therapy-related malignancy is exceedingly rare , and its pathogenesis has not been well characterized, particularly in relation to chemotherapeutic agents. Here, we report a case with the sequential development of biclonal MPNs; the patient initially developed chronic myelogenous leukemia (CML) and subsequently developed primary myelofibrosis (PMF) following the treatment for diffuse large B-cell lymphoma (DLBCL). We thank Steven Conlon in the Department of Pathology at Duke University Medical Center for the technical assistance of photo images and figure illustration.